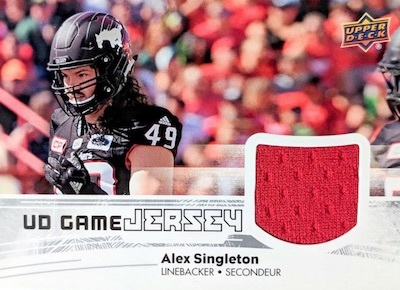 Taking collectors north of the border for some gridiron action, 2018 Upper Deck CFL Football offers some of the top players and teams from the Canadian Football League. Doubling the totals from 2017, each Hobby box averages two autographs and two memorabilia cards. 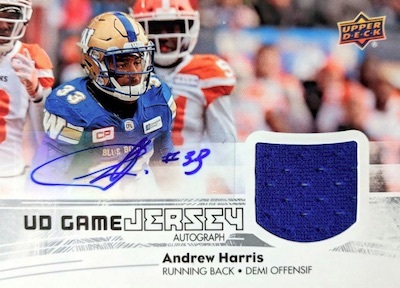 Further increasing the coverage, the base set in the 2018 Upper Deck CFL Football checklist now totals 200 cards with two being checklists. 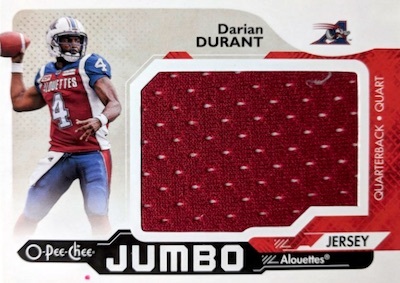 There are also limited parallels that combine to drop 12 per box. Each box includes at least 8 Red Border (#/150) and 2 Gold Border (#/50) cards. Finally, the rare Purple Border (#/15) parallels are joined by base Blank Back short prints. 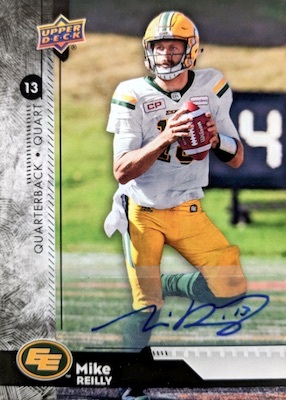 The hits for 2018 Upper Deck CFL Football include Base Autograph cards that add a signature to the main design. Subjects in Group B average 1:8 packs while Group A is quite a bit tougher at 1:267 packs. Incorporating a relic, UD Game Jersey (1:10 packs), UD Game Patch (#/25) and new UD Game Jersey Autograph (1:350 packs) inserts all showcase the same basic look. 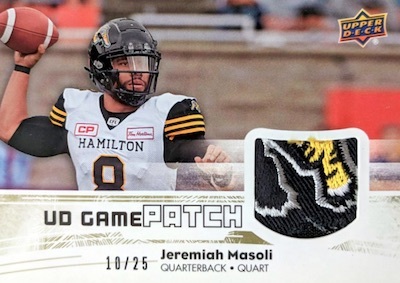 Also debuting in 2018 Upper Deck CFL Football, O-Pee-Chee Jumbo Jersey (1:92 packs) utilizes the OPC style along with a substantial game-used swatch. PARALLEL CARDS: Blank Back SP, Red #/150, Gold #/50, Purple #/15. 1 card. 1:320 Hobby packs. 102 cards. Shop autographs on eBay. Overall odds - 1:8 packs. I’m happy that Upper Deck is stepping it up this year after the 2017 … whatever that was. Will the checklist remain roughly the same as previous years? Offense with Defence and All-star shirt prints? I like the new format of the base cards. Up to 200 is good, mixing offence, defence, and special teams together and doing away with the SP subsets is a great change. Maybe it won’t be so hard now to build a complete set. Hello again Trey. 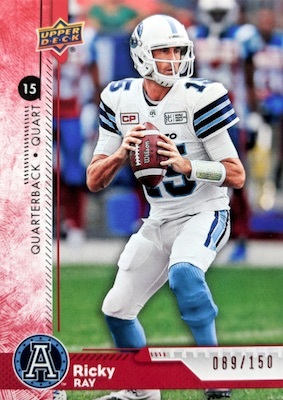 Do you know when these cards/boxes will become available in the US? I haven’t found a single pack or box yet in any local stores. eBay has single cards listed for sale but not a single hobby or retail box listed from there. Will it be a while before we start seeing boxes available for purchase here in the US? Thanks buddy.